I worked with Grayson Smith all through the 70's as he started Grayson Smith Carpet & Upholstery Cleaning. I left Memphis to pursue opportunities and returned to Memphis in 2006 to join Grayson as his partner. Not changing the bags. 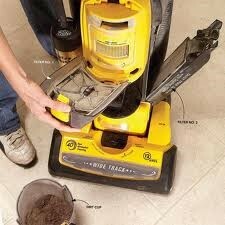 When your bag or bin (for bagless vacuums) is 1/2 full, suction power is reduced by at least 50%. This means you need more strokes over an area to clean it and it is making the motor work harder. It is best to change the bag or empty the bin when 1/3 to 1/2 full. Using the brush on bare floors. A powered brush is critical for deep-cleaning carpets. But the revolving bristles can scatter debris while scratching the finish on hardwood and the plastic wear layer on laminate floors. Most of the newer vacuums let you switch off the brush when needed. If your vacuum cleaner is not able to switch off the beater bar, it would be good to get a vacuum for bare floors that does not have a beater bar. Vacuuming hard, sharp objects. Nails, screws, coins and even paper clips can rip bags and damage the machine. Either pick them up or sweep them up with a broom before vacuuming. Sucking up water or wet messes. Had a flood? Avoid the risk of electrocution by leaving your upright or canister in the closet. Use a wet-dry vacuum with a ground-fault interrupter for standing water or even damp debris. Tossing it when it loses suction. Full bags aren’t the only reason a vacuum’s suction can suffer. Check the hose to see if it is clogged. If the hose is clear, check the filters found on bagged and bagless vacs. Also, if the brush roll barely turns, check it and the drive belt for tangled string or hair. Assuming the motor has blown. Many models have a thermal switch that cuts current to the motor if it begins to overheat. If your vacuum shuts off during use, check for a full bag or bin or a dirty filter. The switch should reset itself, though some models have a reset button for that purpose. If you have asthma or allergies, this article is for you. Asthma impacts more than 34 million people, and one of the main asthma triggers is an allergen found in dust mite droppings which can also induce allergic reactions in some individuals. So, what are dust mites? They are microscopic creatures that thrive in the indoor environment provided by homes, specifically in bedrooms and kitchens. They survive well in mattresses, carpets, furniture and bedding. 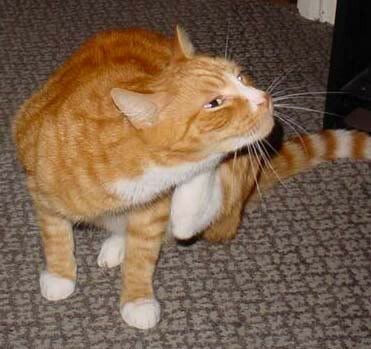 Dust mites shed skin and feces which become a major part of house dust. For most people, this type of dust is not harmful, but it does affect asthma sufferers and people with certain allergies. The following are good tips provided by the Institute of Inspection, Cleaning and Restoration Certification, IICRC.org. 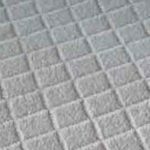 Dust and dust mop regularly: Microfiber dust cloths have been found to be very effective at attracting and removing dust. Increase carpet cleaning frequency: Have carpets deep cleaned at least once a year and more often in high-traffic areas. Limit mold growth: Increased cleaning frequencies will also help limit mold growth. Mold produces the same allergens that impacts asthma sufferers. Focus on overlooked areas where people spend time: For example, home offices and chairs. These can become a breeding ground for dust mites. You probably do not want to know this, but it is not a defect in your carpet. 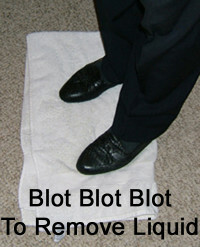 It is called soil filtration which is a term used to describe dark, gray (sometimes black) lines that appear on carpet. Soil filtration occurs because the carpet acts as a filter to dust and other airborne particles resulting from a concentrated flow of air over the carpet. It is most commonly found around baseboards, under doors and along the edges of stairs. The primary reason for this concentrated flow of air is pressure changes within a room. Pressure changes occur within a room from either the effect of warmer air rising or from your heater or air conditioner blowing air into a room without a return vent. Because of the pressure change, air tries to flow either in or out of the room. For walls that are not sealed to the floor, air moves in and out of the room at these areas and that is why you will see it along walls and stairs. For these situations, unless the air leakage areas are addressed, the soil filtration will continue to occur. Also, have you ever noticed a grayish or dark line at the doorway of a room? Especially a closet or a room that is rarely used and the door is always shut. Once again, soil filtration. It is quite common for dirt and dust to accumulate under doors when they are shut. 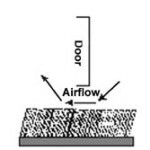 Due to pressure differences between rooms (as described above), air will flow from the high pressure room to the lower pressure through the largest available holes. With the door shut, the undercut of the door is generally the largest available hole. Therefore, as the air passes between the door undercut and the carpeting, the carpet acts like a filter taking out dirt and dust particles from the air. For these situations, you might consider leaving the door cracked so air can move through the doorway and not under the door. Replacing carpets can be expensive so here are some tips on making them last. Believe it or not, carpet appearance deterioration comes from the sticky stuff in your life. Dirt can have a sticky component. So can people, air systems, food and drink, smoking, foreign matter (including smog), pets and residue from “do-it-yourself” cleaning products. The answer; preventative maintenance and periodic commercial cleaning. Preventative maintenance is the least costly and the most effective means of maintaining a carpet’s appearance. There are two goals of maintenance. One is to limit the amount of soil that comes into contact with the carpet through the use of walk-off mats. The other is to limit its accumulation through routine vacuum cleaning. Walk-off mats should be placed at all entrances to reduce the soil that comes into the home. 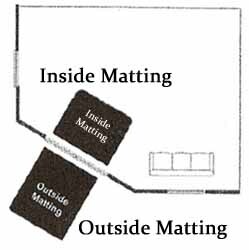 It is best to have an outside mat and an inside mat at each entrance. Outside mats should be capable of scraping debris off of shoes. Inside mats are needed to remove the smaller particles of dirt as well as oils and other liquids that can be tracked inside. Routine vacuuming is necessary to reduce the amount of soil that can accumulate. There are many types of vacuums available but the best one is the one that you will actually use. Make sure it has a beater brush to get the soil to release. It is also important to empty your bag when it is ¼ to ½ full. Once the bag gets over 50% full, its efficiency diminishes dramatically. The final aspect is periodic professional cleaning. The commercial grade equipment and expertise associated with reputable companies provides removal of the deep down dirt and removal of spills and spots. In fact, most major carpet manufacturers require professional cleaning every 12 to 18 months to maintain the carpet’s warranty. Berber carpets are an aesthetically appealing carpet that allows for unique designs and color schemes. However, berber carpets are not a style of carpet but a specific weave. It is a loop pile construction and can be made from many different materials and in many different qualities. The looped design does provide a cushiony feel under your feet and this is especially true with the wool and nylon varieties. While berber carpets can be visually pleasing and comfortable, there are some aspects that need to be considered when either buying berbers or deciding in which parts of your home to install them. They can snag and unravel or run, similar to a run in ladies hose. 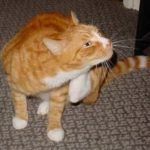 Situations where this can be a real concern is with cats who use the carpet as a scratching post and dogs that like to dig on carpets. Also, this type of carpet is difficult to clean. Because of the loop weave and the twist of the loop being larger at the top than the bottom, It draws dirt to the bottom of the fibers and traps it there. This dirt, trapped at the bottom, is very difficult to extract with a vacuum cleaner. As a result, traffic patterns can develop prematurely. 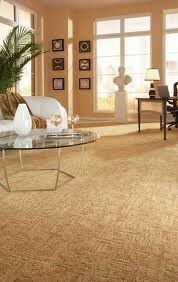 Finally, the less expensive berber carpets will also tend to show wear patterns quicker. Therefore, you might want to reconsider berber carpets for high traffic rooms such as dens, stairs and halls. Especially if you are not able to vacuum them regularly. Also, if you have pets that like to scratch, you might reconsider the use of this type of carpet all together. Sculptured carpet is a design of carpeting that is characterized by a mixture of high and low pile fibers arranged according to a specific pattern. The appeal of this type of carpet is in the visual presentation. Sculptured carpets can be an effective means of adding interest to a room by providing a layered effect to the floor covering. It is considered to be an excellent means of increasing the visual interest of the floor covering without the use of different colors to create a pattern. 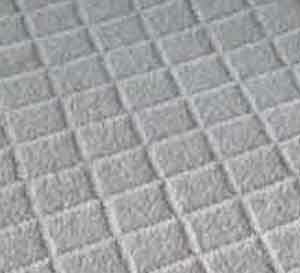 However, a concern with sculpted carpets over non sculpted carpets is the wear tendency in high use areas of the home. Because of the high/low aspect of this carpet, wear patterns tend to become more prevalent in high use areas. This is due to the walking and dragging of feet on the carpet which impacts the less supported taller fibers. Therefore, avoiding the use of this type carpet in high traffic areas should be considered. Examples of high traffic areas are dens, TV or play rooms, stairs and halls. Also, once the carpet is installed, regular vacuuming and periodic professional cleaning are important. By doing this, you will increase the longevity and maintain the beauty of this type of carpet longer. As mentioned earlier, sculpted carpets can be used to enhance the look of the flooring without using a lot of color that may clash with other furnishings in the room. However, it would be prudent to avoid them in high use areas. And once installed, vacuum regularly and periodically have them professionally cleaned. 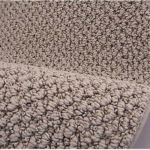 Having wall-to-wall carpeting offers distinct benefits, but sometimes walking on it can become hazardous and its appearance can deteriorate due to buckling or rippling. The reasons for ripples across the floor can range from improper installation to excess humidity to long term wear. To understand why ripples happen, it is good to understand how carpets are fabricated. Most residential carpet is manufactured by inserting yarn into a backing material to form the face material. The yarn/face material and primary backing is then back coated with a synthetic latex adhesive to lock the fibers in place. Finally, a secondary backing is applied to provide dimensional stability. (See diagram). Improper installation methods almost always guarantee carpet rippling and can range from the installer not using a power stretcher or only power stretching in one direction. 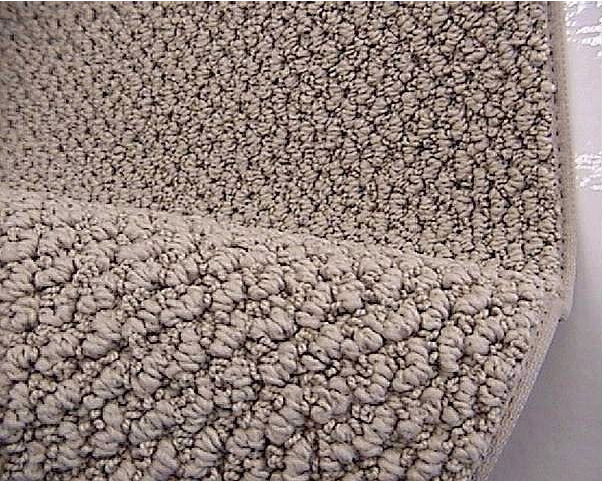 Also, padding with improper thickness or density for the carpet can also cause rippling. Therefore, make sure to purchase the proper carpet pad for your carpet and to use a qualified carpet layer for installation. Excessive water from humidity or improper steam cleaning can break down the latex adhesive and cause premature rippling. Stretching the carpet can help the appearance but the carpet has probably been damaged and buckling will more than likely return. Replacement might be your best option. Finally, buckling occurs overtime because the carpet stretches due to regular foot traffic and wear. 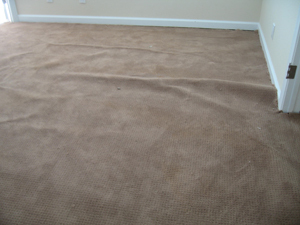 Every carpet reaches an age when it must be replaced because the secondary backing and latex start to breakdown. Stretching the carpet can remove the ripples for a period of time but these areas will still be prone to buckling over time. Wool carpets remain a favorite for their warmth, luxurious feel and durability. A good quality wool carpet is typically more expensive than other fibers. However, if maintained properly, the wool carpet, due to its durability, can save you money over its lifetime. However, if not maintained properly or if staining concerns is a part of your life, wool may not be the best choice. For homeowner’s who either vacuum their carpets regularly or have them vacuumed regularly, wool will last longer than other fibers and would be a good investment. The reason that vacuuming is so important is that through normal home living, grit gets into the carpet fibers. If this grit is not removed by regular vacuuming, it will act like sand paper on the carpet fibers, damage them and create premature wear patterns. Therefore, if regular vacuuming of your carpets may be difficult to achieve, it might be prudent to invest in a less expensive type of carpet. If spills and staining are not a big concern, wool once again is an excellent choice. Wool has natural oils inherent in it which have a tendency to repel liquids. Therefore, if you can get to spills quickly, the wool provides good stain resistant qualities. 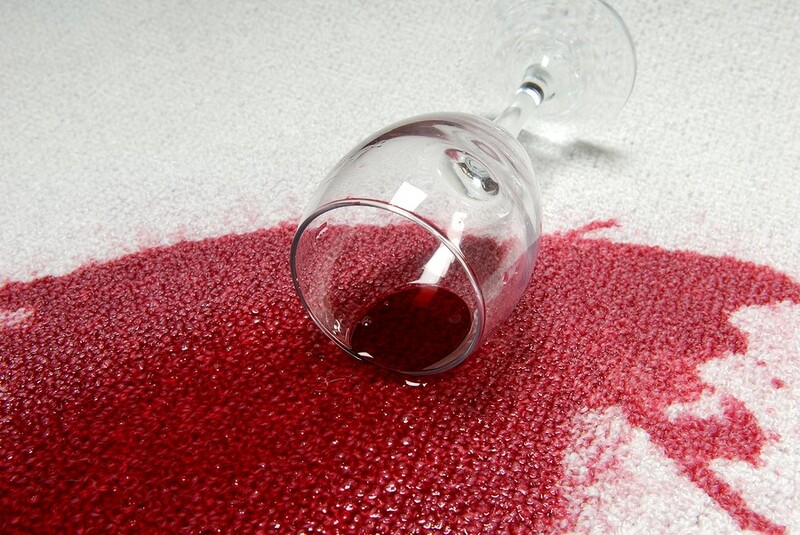 However, if a spill is left unattended, it seeps past the natural oils in the wool, absorbs into the fibers and has a high probability of becoming a permanent stain. If staining is a concern (from kids, pets and parties), then synthetic carpets would most likely serve you better. 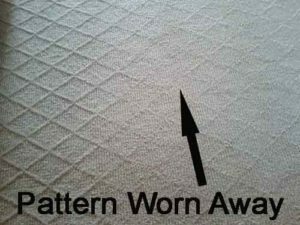 They come in all “levels” of stain-resistance, from very basic synthetic fibers, to those treated with Teflon and other solutions. So, if you have good maintenance of your carpets and have the ability to address spills quickly, then wool, over its life, is your most cost effective choice. However, it either of the above concerns is an issue, then your money might be better spent on a synthetic carpet.